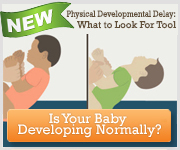 By the second month, your baby will spend much of each day watching and listening to the people around him. He learns that they will entertain and soothe him, feed him, and make him comfortable. He feels good when they smile at him, and he seems to know instinctively that he can smile, too. Even during his first month, he’ll experiment with primitive grins and grimaces. Then, during the second month, these movements will turn to genuine signals of pleasure and friendliness. Have you experienced his first true smile yet? It’s a major turning point for both you and your infant. In case there was any doubt in your mind, all the sleepless nights and erratic days of these first weeks suddenly seem worthwhile at the sight of that first grin, and you’ll do everything in your power to keep those smiles coming. For his part, your baby suddenly will discover that just by moving his lips he can have two-way “conversations” with you, as his grins bring him even more attention than usual and make him feel good. Smiling also will give him another way besides crying to express his needs and exert some control over what happens to him. The more engaged he is with you and your smiles, and eventually with the rest of this great big world around him, not only will his brain development advance, but the more he’ll be distracted from internal sensations (hunger, gas, fatigue) that once strongly influenced much of his behavior. His increasing socialization is further proof that he enjoys and appreciates these new experiences. Expanding his world with these experiences is not only fun for both of you but also important to his overall development. At first your baby actually may seem to smile past you without meeting your gaze, but don’t let this disturb you. Looking away from you gives him some control and protects him from being overwhelmed by you. It’s his way of taking in the total picture without being “caught” by your eyes. In this way, he can pay equal attention to your facial expressions, the sound of your voice, the warmth of your body, and the way you’re holding him. As you get to know each other, he’ll gradually hold your gaze for longer and longer periods, and you’ll find ways to increase his “tolerance”—perhaps by holding him at a certain distance, adjusting the level of your voice, or modifying your expressions. By three months, your baby will be a master of “smile talk.” Sometimes he’ll start a “conversation” by aiming a broad smile at you and gurgling to catch your attention. At other times he’ll lie in wait, watching your face until you give the first smile and then beaming back his enthusiastic response. His whole body will participate in these dialogues. His hands will open wide, one or both arms will lift up, and his arms and legs will move in time with the rhythms of your speech. His facial movements also may mirror yours. As you talk he may open his mouth and widen his eyes, and if you stick out your tongue, he may do the same! Of course, your baby probably won’t act this friendly with everyone. Like adults, your infant will prefer certain people to others. And his favorites, naturally, will be his parents. Then, at about three or four months, he’ll become intrigued by other children. If he has brothers or sisters, you’ll see him beaming as soon as they start talking to him. If he hears children’s voices down the street or on television, he may turn to find them. This fascination with children will increase as he gets older. Grandparents or familiar sitters may receive a hesitant smile at first, followed by coos and body talk once they’ve played with your baby awhile. By contrast, strangers may receive no more than a curious stare or a fleeting smile. This selective behavior tells you that even at this young age, he’s starting to sort out who’s who in his life. Although the signals are subtle, there’s no doubt that he’s becoming very attached to the people closest to him. This unspoken give-and-take may seem like no more than a game, but these early exchanges play an important part in his social and emotional development. By responding quickly and enthusiastically to his smiles and engaging him often in these “conversations,” you’ll let him know that he’s important to you, that he can trust you, and that he has a certain amount of control in his life. By recognizing his cues and not interrupting or looking away when he’s “talking,” you’ll also show him that you are interested in him and value him. This contributes to his developing self-esteem. When his needs are urgent—when he’s very hungry or in pain, for instance— he’ll let you know in his own special way, perhaps by screaming, whimpering, or using desperate body language. In time you’ll learn to recognize these signals so quickly that you usually can satisfy him almost before he himself knows what he wants. While your baby is peacefully asleep, or when he’s alert and entertaining himself, you’ll feel reassured that you’ve met all his needs for the moment. This will give you a welcome opportunity to rest or take care of other business. The times when he’s playing by himself provide you with wonderful opportunities to observe—from a distance—how he is developing important new skills such as learning to play by himself, reaching, tracking objects, or manipulating his hands. These activities set the stage for learning to self-soothe, which will help him settle down and ultimately sleep through the night. These are especially important skills for more colicky or difficult-to-console babies to learn. Each day there will be periods when your baby’s obvious needs are met but he’s still fussy or fitful. He may let you know this with a whine, agitated movements, or spurts of aimless activity between moments of calm. He probably won’t even know what he wants, and any of several responses might help calm him. Playing, talking, singing, rocking, and walking may work sometimes; on other occasions, simply repositioning him or letting him “fuss it out” may be the most successful strategy. You also may find that while a particular response calms him down momentarily, he’ll soon become even fussier and demand more attention. This cycle may not break until you either let him cry a few minutes or distract him by doing something different—for example, taking him outside or feeding him. As trying as these spells can be, you’ll both learn a lot about each other because of them. You’ll discover how your baby likes to be rocked, what funny faces or voices he most enjoys, and what he most likes to look at. He’ll find out what he has to do to get you to respond, how hard you’ll try to please him, and where your limits of tolerance lie. Over time your baby’s periods of acute need will decrease, and he’ll be able to entertain himself for longer stretches. In part, this is because you’re learning to anticipate and care for many of his problems before he’s uncomfortable. But also, his nervous system will be maturing, and, as a result, he’ll be better able to cope with everyday stresses by himself. With greater control over his body, he’ll be able to do more things to amuse and console himself and he’ll experience fewer frustrations. The periods when he seems most difficult to satisfy probably won’t disappear entirely for a few years, but as he becomes more active, it will be easier to distract him. Ultimately he should learn to overcome these spells on his own. During these early months, don’t worry about spoiling your baby with too much attention. Observe him closely and respond promptly when he needs you. You may not be able to calm him down every time, but it never hurts to show him how much you care. In fact, the more promptly and consistently you comfort your baby’s fussing in the first six months, the less demanding he’s likely to be when he’s older. At this age, he needs frequent reassurance in order to feel secure about himself and about you. By helping him establish this sense of security now, you’re laying a foundation for the confidence and trust that will allow him gradually to separate from you and become a strong, independent person.